For a small town girl from Stratford, CT, the Stratford Town Hall, Sterling House and Public Library were gems! Having lived in MIA, NYC, SFO, and RIO, etc., there are many choices. However residing in Miami Springs, FL since 1961, my favorite is The Curtiss Mansion! September 1969. From the 14th floor of a Manhattan office building, I viewed Nikita Khrushchev on his historic ‘First visit to America,’ waving from a motorcade as they came through the upper Grand Central Station onto Park Avenue. The Pan Am Building built in 1960 (now the MetLife) eventually hovered over the same. Back in 1952, I worked at the Florida National Bank at the beautiful DuPont Building in downtown Miami. One evening after work, I joined some co-workers for an evening Stewardess Course at the Lindsey Hopkins Vocational School. A few months later, our graduation dinner was held at the Miami Springs Villas, in the Hunt Room on the second floor. Thus, my first visit to the Curtiss Mansion. In May 1955 I went through training with Pan American World Airways, Inc., in Miami and was based at Idlewild Airport at New York’s LAD (Latin American Division), with flights to Central and South America. In 1957, I transferred to the PAD (Pacific Division), based in San Francisco. Lindsey Hopkins Stewardess Graduation in the former Hunt Room of The Curtiss Mansion. Nikki is second from the left, already working with PanAm. May 1954. My roommates and I enjoyed scanning apartment ads in the lobby of the beautiful Fairmont Hotel. Waikiki layovers coming and going at the PanAm Honolulu Hawaii Base, crisscrossing the Pacific to the Orient (Asia), Manilla, Tokyo, Hong Kong, Australia, and Fiji. All prior to the Jet Age. Passengers were often soldiers from the Vietnam War in need of some R&R. As required, I resigned from PAA to get married in 1958. However, a change of plans ensued and in the Spring of 1961, after a wonderful experience living and working in the Big Apple for a major Advertising company, I was back in Miami with one of my roommates, a Northeast Airlines Stewardess who introduced me to my future husband. He was an Aviation Sales Rep with Charlotte Aircraft and a passenger on my roommate’s flight. He learned that being from Boston she was not happy with Miami’s humidity in April and invited her and a friend to Luncheon and a swim at the Miami Springs Villas Pool. This is where we met: when he came by to check that all was well. The steps to that pool stand alone today. Les was a divorced true Southern gentleman from Alabama, now dating this Yankee girl. We found we had a great deal in common, enjoyed each other’s company, and frequented the many facilities within the Villas complex where he resided between travels. He often asked me to assist in hosting and accompanying him to dinners with clients who traveled with their wives and families. One evening, the Maître at King Arthur’s Court exclaimed: “Mr. Jester, you two make a good looking couple! You ought to marry this girl”. He agreed and from then on he would introduce me to people as the girl he was going to marry! A courting time ensued and due to a considerable age difference, my instinct was to run. Fortunately for us, he was persistent! We married in August 1961, and in July 1966 I gave birth to our daughter Melinda, who made us very proud parents! The “Villas” consisted of two, two-story rooms (or suites) overlooking Deer Run and the Golf Course; The Two Story Mansion was the Main Entrance with “Small Bar,” Living and Dining Rooms (including rooms on the second floor). Backing the entire two-story above the ground swimming pool was the famed “King Arthur’s Court,” featuring Max Brown and the Singing Violins, a Horseshoe Bar, Central Cocktail lounge circling a fireplace facing the orchestra, and the dance floor. Next came one of many beef-aging rooms on the property, storing all that famous prime rib. An adjoining building housed the Aviation Executive Club; the south end nearby for very large parties, conventions etc., was the “Playhouse” and “The Florida Room” with large windows facing the Golf Course. 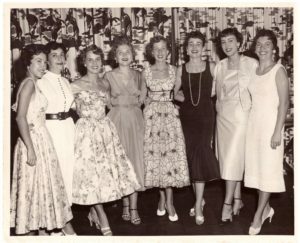 The Miami Springs Woman’s Club often held their “May Breakfast,” also know as “The Installation Luncheon” in this Florida Room. At the end of the West side was the private “Carriage Club”. One of the first to use a ‘key card’ to enter. It also included a cocktail lounge with bar, an additional dining room, and the Diamond Jim Brady Room for members and private parties. Les and I, and a Pan Am executive friend were having lunch in that dining room when the news broke on the TV monitor that President Kennedy had been shot. Miami Springs has always been an Aviation Community due to its close proximity to the Miami International Airport. The “Villas” were often frequented by locals as well as visitors from far away. The last addition to the grounds during the 1960s was a two story Colonial-looking brick building with white trim across the entryway to King Arthur’s Court, built by Eastern Airlines for their Flight Service Training facility. As a family, we enjoyed this marvelous facility. So close to home, and so much a part of our lives. Many a celebration was held there and often, after church, we had a Sunday Brunch where Melinda and other children enjoyed the local wildlife at the nearby pond. My surprise 80th birthday party was sponsored by my daughter three years ago at the newly rebuilt Curtiss Mansion. It was in the Living Room with the beautiful Fireplace and original bricks that survived fires and vandalism over the vacant years. I was a part of many installations in front of that fireplace since 1962 with The Woman’s Club and World Wings Int’l, a former PanAm Flight Attendants club who volunteered on a regular basis whenever called upon. Thanks to the perseverance of our City, the CMI Board, and many caring individuals and volunteers, our Historic Curtiss Mansion stands proud. It was and still is the only building that is left of the exceptional “Miami Springs Villas” complex, which was made famous by the talented entrepreneur Mr. Art Bruns. The structure was owned by a Mr. Gardner from Canada, whom Les and I had the pleasure of meeting one evening at the incomparable King Arthur’s Court.